Combine orange juice, chicken broth, soy sauce, brown sugar, ginger, pepper, and garlic in slow cooker. 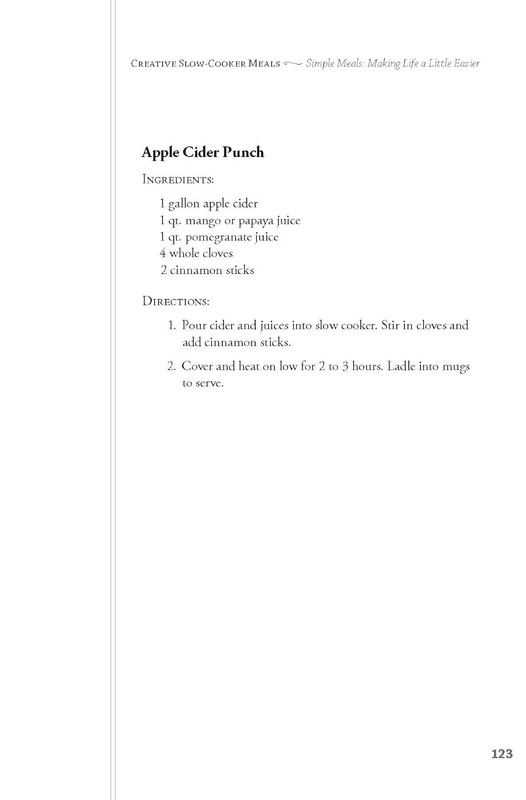 Mix well and add chicken wings. Stir to coat. Cover and cook on low for three hours*. Add peanut butter and stir to combine. Cover and continue cooking on low for one hour. Sprinkle with peanuts and serve over brown rice. *Not all crockpots are created equal. Truth to tell, I cooked this in the oven at 375° for an hour, then added the peanut butter and cooked for another half hour. Delicious! I cook it, Amoeba eats it. Lately I have been cooking two crock pots at a time! That doesn’t mean we have been eating twice as much, but we have been eating twice as good! 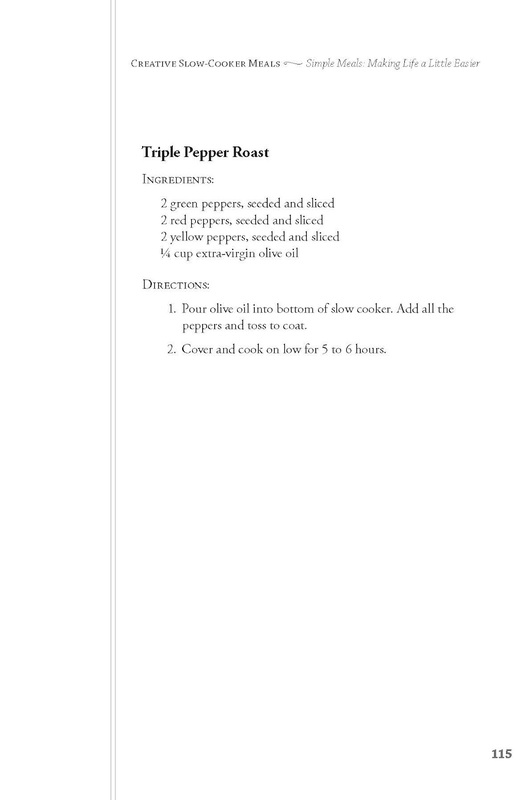 When my schedule gets busy I’ve always relied on a a couple of favorite crock pot soup recipes. 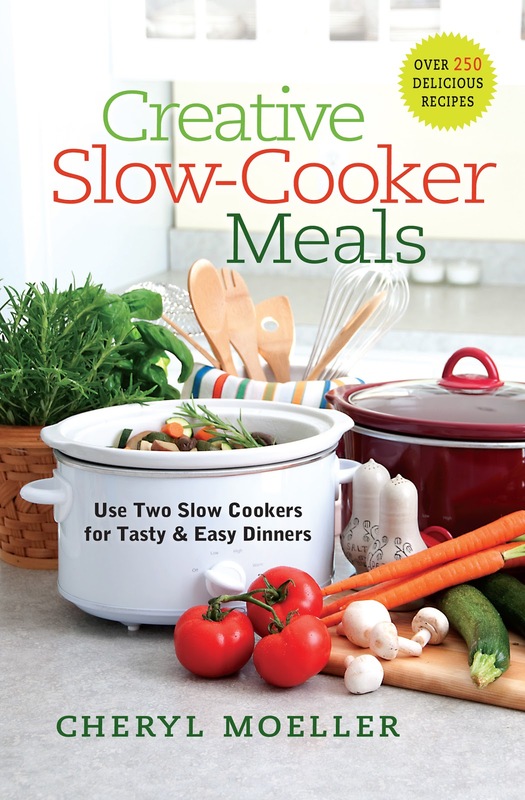 I also have crock pot recipes I prefer for roasting beef, pork and chicken, but until I discovered Cheryl Moeller’s cookbook, Creative Slow-Cooker Meals: Use Two Slow Cookers for Tasty and Easy Dinners, I only used multiple crock pots on my holiday buffet table. 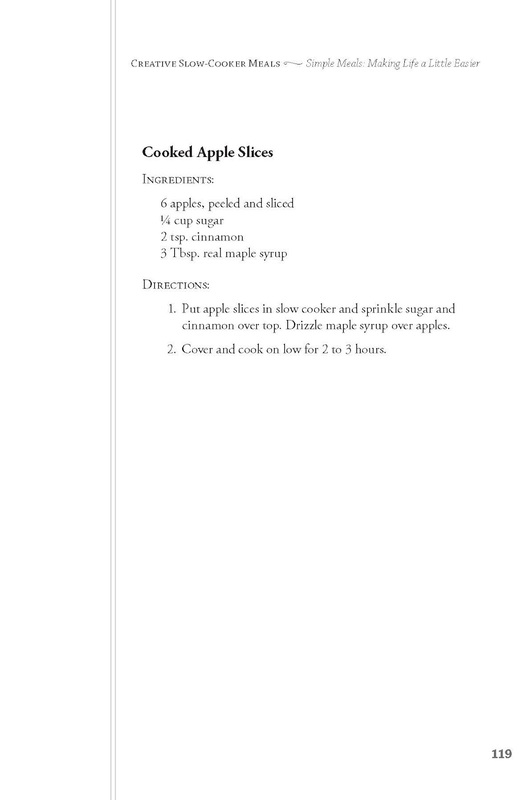 Many of the recipes in Moeller’s book are actually brilliant suggestions. Do you have trouble keeping enough tortillas warm and at hand when you’re serving your favorite Mexican dish? Then check out page 175 and marvel at how easy the solution is. 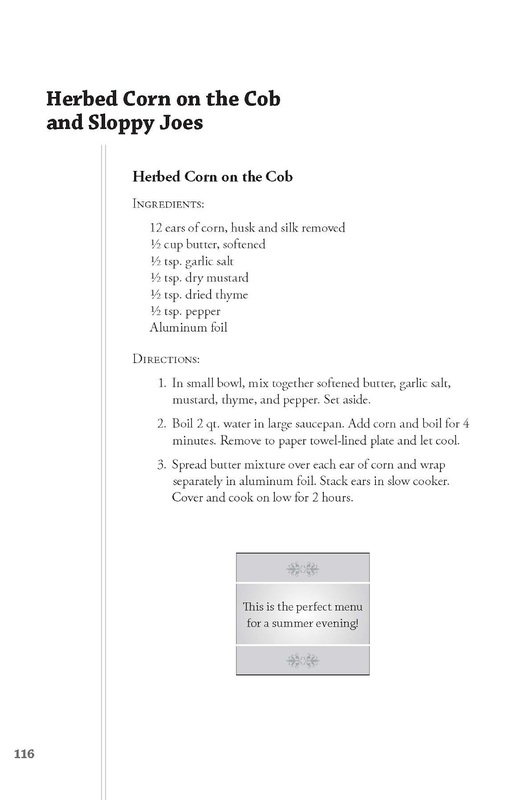 If you’re like my sister-in-law and don’t care to eat food that’s been simmering in a pot all day, this cook book is still for you. 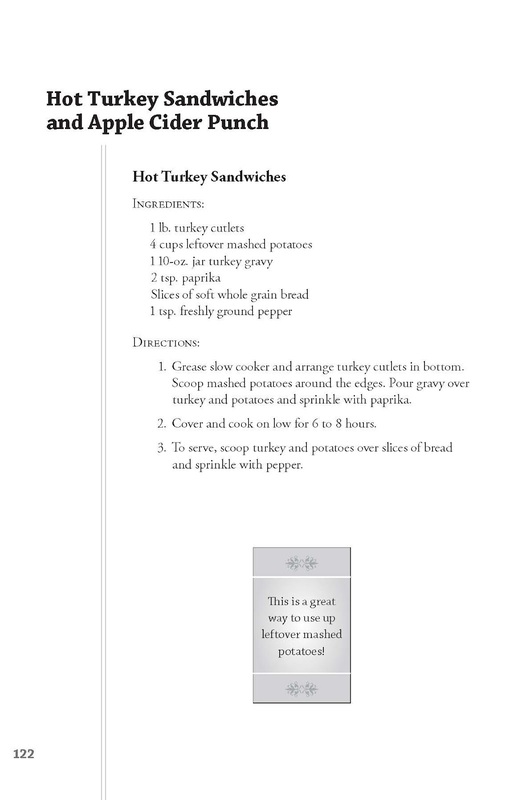 Many of the recipes have 2 to 4 hour cook times. Some even cook in an hour or less. And did you know you can bake homemade bread in your crock pot? 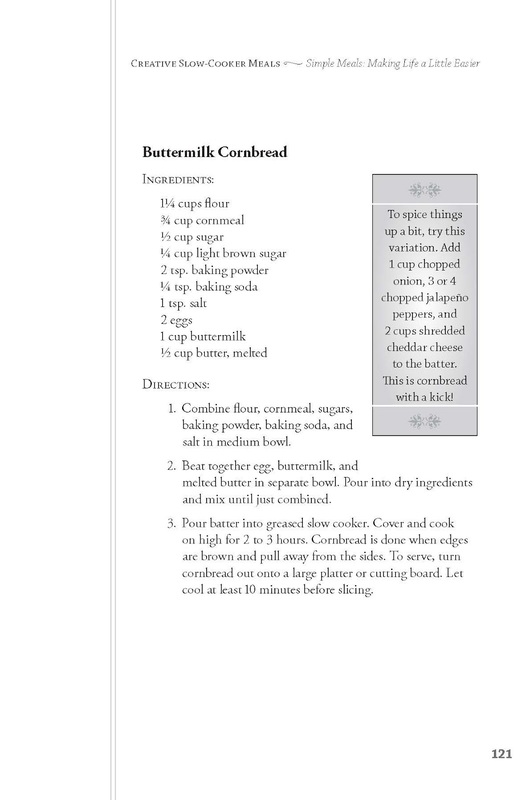 This weekend I will be baking whole wheat bread using the recipe on page 180. I’ll let Amoeba pick dessert, Apple Upside Down Cake (p. 246), Caramel Baked Apples (p.224) or maybe the Molten Lava Pudding (p. 253) from the gluten free section. 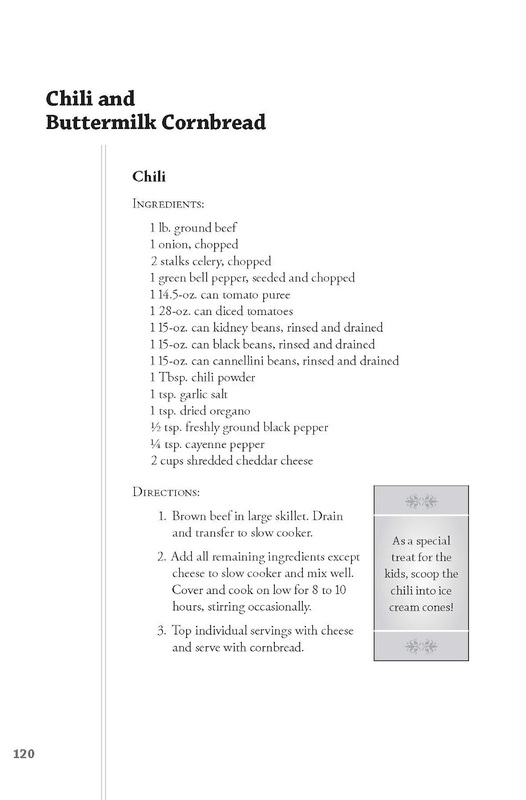 My new favorite crock pot recipe can be found on page 228. It is Hungarian Goulash, and we scarfed it down with crock pot baked biscuits. I was also pleasantly surprised by the Spaghetti recipe on page 138. 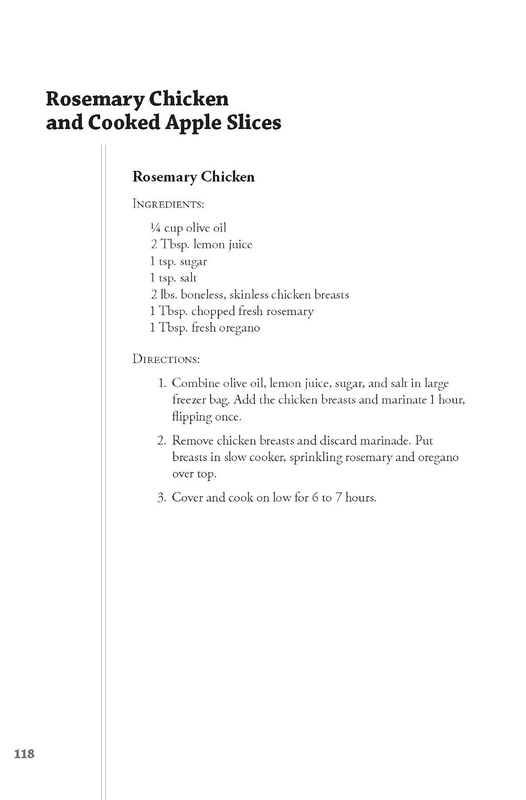 I guess what I am trying to say is, this isn’t a recipe book that will spend a lot of time languishing on the shelf. It’ll be working in the kitchen. Cheryl Moeller is a seasoned mother and a standup comic. She is also a syndicated columnist with her own blog (www.momlaughs.blogspot.com) and contributes monthly to several online parent websites. Cheryl has coauthored two books on marriage with her husband and has written for www.mops.org and Marriage Partnership. Cheryl does comedy for parenting classes, MOPS groups, wedding or baby showers, church retreats, women’s conferences, and those in line at the grocery store. 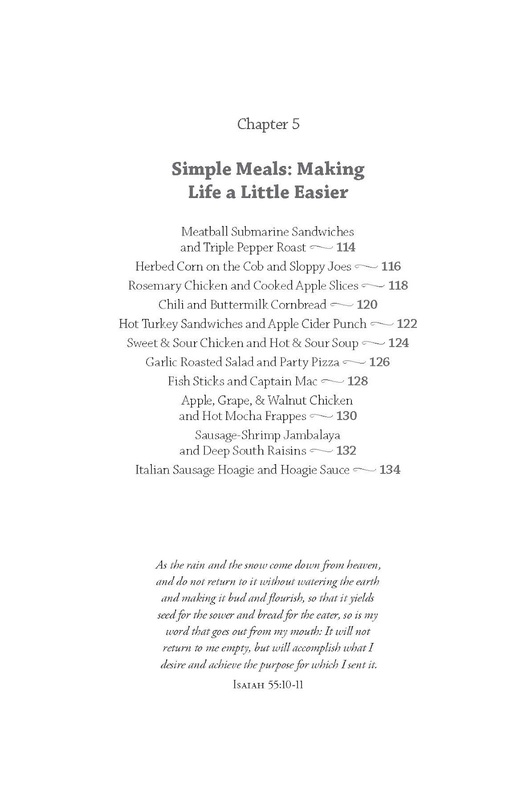 From the celebrated coauthor of The Marriage Miracle comes a new kind of cookbook and a new attitude toward planning meals. With an eye toward the whole menu, not just part of it, columnist Cheryl Moeller teaches cooks to use two crockpots to easily create healthy, homemade dinners. … and many more! Perfect for the frazzled mom who never has enough time in the day, Creative Slow-Cooker Meals gives readers more time around the table with delicious, healthy, frugal, and easy meals! I’ve Given It All Away! Insulated lunch bag, sandwich makeover recipe booklet, and $3.75 in meat, cheese and mayo coupons provided by Houseparty.com's Kraft Foods Ultimate Sandwich Makeover House Party™. 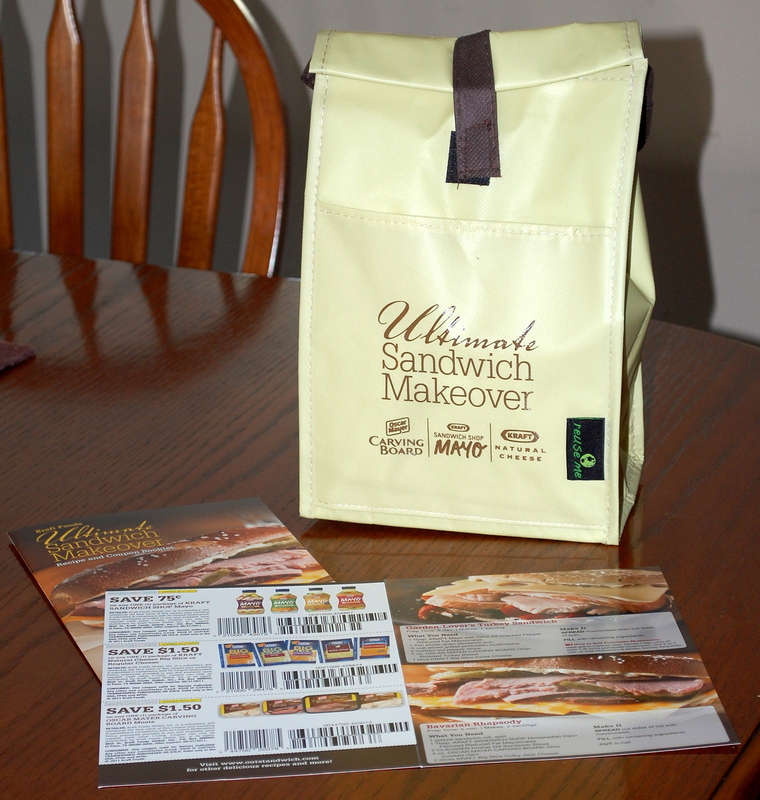 Four people entered my second chance drawing for this wonderful insulated lunch sack, a sandwich recipe booklet, and the $3.75 cents worth of coupons. (First drawing here: Lunch at Quilly’s.) Two of the coupons ($1.50 All Natural Big Cheese; $1.50 Oven Roasted Carving Board Meats) were worth about 50% of the product’s original purchase price. The third coupon is for 75 cents off a bottle of deli spiced mayonnaise. Good stuffs. Kraft Carving Board Roast Beef, a slice of cheddar, lettuce, tomatoes, and the Horseradish Dijon. Seeded rye bread, toasted liberally spread the Sandwich Shop Horseradish and Dijon mayo on the toast. Add some Kraft Big Slice pepper Jack and melt under the broiler. Add some crisp iceberg lettuce, thin sliced red onion and thin sliced beefsteak tomato. Finally top with Oscar Mayer Carving Board Ham and the other piece of toast. Homemade bread spread with Kraft Sandwich Shop Mayo’s garlic & herb flavor. Add Oscar Mayer’s Carving Board ham, one large slice of tomato (sandwich size), then Kraft Big Slice Swiss cheese. 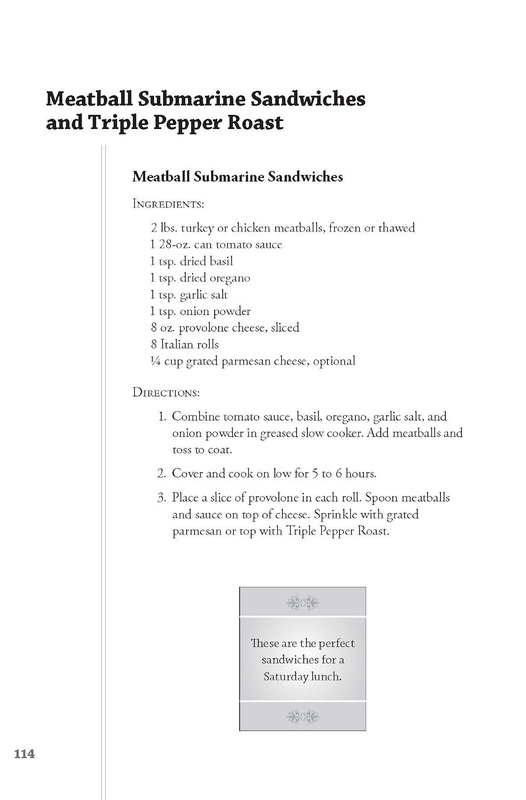 Spread outside of sandwich with garlic butter and sprinkle with basil then toast till golden and cheese is melty. A pretzel roll spread with the horseradish dijon, then topped with the Oscar Myer ham and a slice of Kraft Swiss cheese (toast lightly to melt cheese). out to you in the next mail.